If what I've read in this thread, I have less reason to worry than I'd thought. 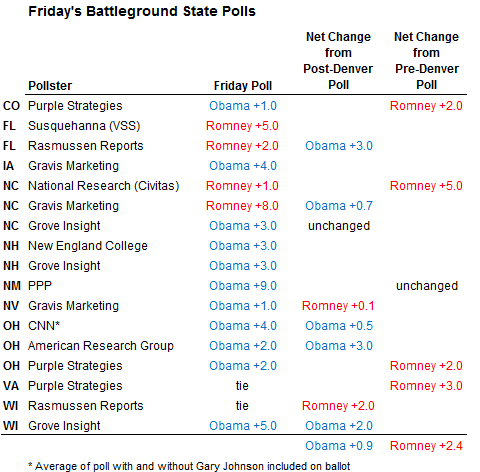 Other sources I've looked at suggest that things are pretty much neck-and-neck. CNN's poll of polls, for example. Thanks for that, engineer. Sometimes I'm afraid to look for fear of seeing the opposite. Cheers. A humoruos article on Nate Silver (creator of fivethirtyeight.com). Good article. It's true that Nate moved to the NYT in 2008, but many of his followers (including me) followed him on his blog way before that. He's not exactly a 'newcomer' to the scene, but I suppose the 'rose to prominence' part is right. The NYT would do that lol. Yes, I remember when it was a big deal that Poblano (Poblano? something like that) was unmasked as Nate Silver. He had a very respectable following on his blog and most have remained loyal. Have you read his column for today yet? The polls are keeping him awake at night LOL! (Means he's earning his paycheck)! This is the Princeton Election Consortium. Strictly math. Interesting stuff. They project Obama with 315 Electoral College Votes. They were dead on in 2004 and 2008 and have since then refined this formula, which calculates 2.3 quadrillion outcomes!